Between 4 and 5pm Eastern time on Monday, Dec 29th 2014 we moved the Spinitron database, web and application services to a new cluster of servers. Service was down during the time it took to transfer all the data to the new system and bring up the database. We switched the DNS A-record for spinitron.com and www.spinitron.com to 104.156.60.5 and the change should propagate out to everyone by about 7pm Eastern time. For now there is a temporary redirect (307) from the old web server to the hv4.spinitron.com. This works fine for all the public pages but if you try to log on to hv4.spinitron.com you get an SSL certificate error. You can dismiss the certificate error as it is expected (it just means that the certificate doesn't apply to hv4.spinitron.com as it does to spinitron.com and www.spinitron.com) and proceed to log in. All this should clear up soon as the new DNS A-record propagates. Anyone using Spinitron's old IP address 198.178.126.244 in their automation system and/or firewall configuration needs to update it to 104.156.60.5. We'll be back soon with some more information about this transition. TV on the Radio's Seeds tops the chart again with 90 spins, followed by Ariel Pink, The New Basement Tapes, Deerhoof and Ex Hex. TV on the Radio's Seeds tops the chart with 101 spins, followed by Ariel Pink, The New Basement Tapes, Deerhoof and Caribou. 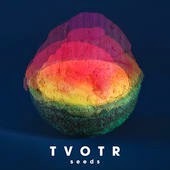 TV on the Radio's Seeds tops the chart with 115 spins, followed by Ariel Pink, Flying Lotus, Caribou and The New Basement Tapes.